Washington (CNN) - As the White House begins a series of events over the next few weeks to highlight the benefits of the new health care law, the number two House Democrat said the President's signature domestic achievement doesn't need to be rebranded, but he regrets referring to the Affordable Care Act as "Obamacare." 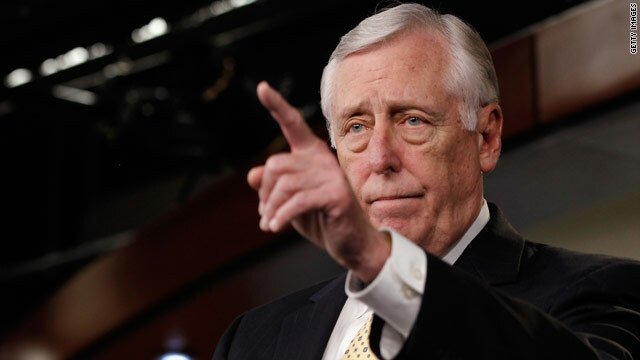 "I wish I hadn't' called it Obamacare before because that has politicized it and has been used by Republicans as a pejorative term," Rep. Steny Hoyer, D-Maryland, told reporters on Tuesday. Hoyer argued the substance of the law will prove valuable, but there still needs to be improvement in the process to get people enrolled, saying, "the brand is OK, it's the process of getting to the brand that isn't OK." He added proponents should emphasize the word "Affordable" in the title of the law's more official name–the Affordable Care Act. While the term "Obamacare" started out as a disparaging term, used mostly by Republicans, the President began to embrace it last year when he was running for re-election, saying he likes it because he does "care." The President and the White House, however, have rarely used the word since the rocky rollout of HealthCare.gov on October 1. In fact, a recent poll found that more people opposed the federal law when it was referred to as "Obamacare" than when it was referred to as the "Affordable Care Act." White House officials briefed House Democrats on Tuesday morning, and addressed concerns that users are having trouble on the back end of the enrollment process – so-called "834" issues that fail to transmit information to health insurers, but Hoyer told reporters the two top Administration officials "believe that is very substantially improved." @ Tony...you forgot to end your sentence, " because he's black". We conservatives want to make sure you libidiots are not confused about why we dislike your ideas. ( Do you recognize sarcasm?) I put that in there in case the blinders are too restrictive. Before long, "Obamacare" will become a synonym for success and justice and it will be just another Republican weapon that will burst in their faces.